Somewhere beyond or behind all musical borders lies a creative terrain where bluegrass, jazz, classical, pop, and various world musics mingle, played by musicians who care more for inspiration than they do for genre. 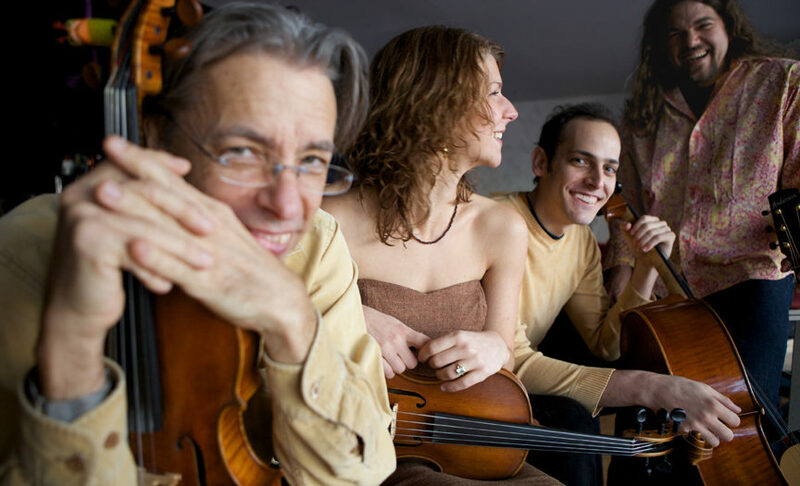 If that place has a name, it’s surely the Republic of Strings, for no one knows its contours better than veterans Darol Anger, Scott Nygaard, and a wave of young brilliant string players. They have created the visionary musical landscape of Generation Nation, the group’s second album for Compass Records. Drawing from an array of sources that includes Ornette Coleman, Scandinavian string bands, Aretha Franklin and the quartet’s own members, Generation Nation documents a unique intergenerational exchange. Compelling musical textures, elegant solos and vocals all emanate from a startlingly diverse group of guests. “There’s a lot of respect and love going on among the players,” says Anger, “and I think it comes out in the music”. One listen proves that he’s exactly right. If Generation Nation relies on intuition for its coherence and wit, it is built on the technical foundation of New Acoustic Music, a style that Anger helped to pioneer during the 1970s and 1980s with groups such as the David Grisman Quintet and the Turtle Island String Quartet as well as on his own groundbreaking solo projects. “I love traditional music of all sorts, but I’m more interested in using all my musical ideas when I play,” says long-time collaborator Nygaard, who was among the musicians attracted by the work of Anger and his colleagues. Scott’s statement serves well as a concise articulation of the New Acoustic credo. Yet over the years, this music’s breadth and difficulty served as a deterrent to younger musicians — until now. Drafting Eggleston and fiddler Brittany Haas — two of the brightest youngsters to emerge from that scene — Anger set about creating a group that would meld the experience he and Nygaard had accumulated with the inquisitive energy and enthusiasm he had seen in the new generation. And on Generation Nation, the group has taken the next step, inviting as guests more young musicians who bring their own talents and perspectives to their appearances. Some of these youngsters who appear on the recording are Aoife O’Donovan (one of the four vocalists on the recording and Eggleston’s band mate in the acclaimed roots band Crooked Still) to cellist and fiddler Tristan Clarridge, (the youngest person ever to win the National Fiddle Championship three times). They are musicians who, as O’Donovan says, see figures like Anger as “an idol and a peer at the same time”. The generational theme is continued with songs like “Bluebird”, a Buffalo Springfield pop hit from the “60”s, in Anger’s words “re-traditionalized” and featuring the most wildly generational lineup: Darol’s old friend Terry Pinkham on vocals, with her phenomenally talented son Josh on mandolin. The final perfect twist to this story is that Terry is the granddaughter of the great Texas fiddle champion Benny Thommasson, who taught Mark O’Connor and inspired Darol in the 1970’s. The Republic of Strings has created a work which, while rooted in the near and distant past, points to an exciting future. “The music seems to be a way for people to connect with something real,” Anger says with tangible excitement. “As consumer culture “that sort of fakery aspect of it” takes over, people get hungrier for something that seems to speak to something real. There’s a spiritual element in music that’s very strong, and music also exemplifies community. It works for these kids, and it works for adults, too” it’s worked for me for 30 years.” And judging by the sound of Generation Nation, it can work for everyone who’s willing to listen.